While on the faculty at Washington University in St Louis during the late 1990’s early 2000’s, the Human Genome Project was well underway. I don’t think we fully realized how quickly knowledge of the genomic map would transform how we view the predisposition of disease, and the role of epi-genetics in this process. Simultaneous to the advancement of medical genetics has been the application of human DNA analysis in the connection of families, and in helping to solve riddles in family history. Our ability has progressed so far that one doesn’t even need to pay thousands of dollars to have their sputum or blood sent to be DNA analyzed; it can be done commercially for often less than $100 by Ancestry DNA, Family Tree DNA, or 23 and Me DNA programs. However, only 23 and Me has ventured into medical applications for an analysis costing often less than $200. With 23 and Me Health & Ancestry you are provided with detailed reports relating to your risk for acquiring certain diseases. You can also have access to your “raw genomic data” that can be processed at a more sophisticated level to identify enzymatic defects that may be causing symptoms or signs treatable with specific enzymatic substrates and precursors found in vitamins and certain foods. For the first time in the history of medicine, we can actually sort things out at the genetic and enzymatic level like never before. It is through uncovering the impact of certain foods, vitamins and other supplements upon gene expression that we are beginning to understand their role upon our health. If you would like to understand more about your own genetic code, including perhaps, your predisposition to certain diseases and what you can do now to prevent them, submit your 23 and Me sputum sample. When you get your results, schedule a brief clinic visit with me and I’ll help you interpret your 23 and Me reports. 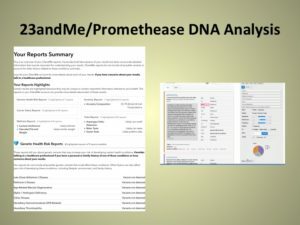 We can then decide whether you might benefit from further analysis of your raw DNA data provided from 23 and Me.